Have you visited the VGEC Facebook page? Go to http://facebook.com/vergerguild and give it a “Like,” then let everyone know what you are doing in your church or share a thought or photo. Michael Sanchez, of Lake Oswego, Oregon recently answered VGEC Communications & Technology Officer, Scott Smith’s call for volunteers by taking responsibility for the VGEC Facebook page. Michael, a music educator by training and vocation, became the verger at ChristEpiscopal Church in Lake Oswego after observing the vergers serving in the consecration service of The Rt. Rev. Michael J. Hanley, Bishop of Oregon. Michael’s vision for using social media in the VGEC is one of creating an accessible social community for vergers and encouraging everyone to join a continuing conversation on and around our Christian liturgy. He sees his role only as a facilitator, saying that, “…the users are the real owners of the site.” He hopes that the page will appeal to vergers of all levels of experience. The ideas Michael has for the page come from his collective experience with the many Facebook pages he currently visits in his professional life and from his experience as an educator and musician. 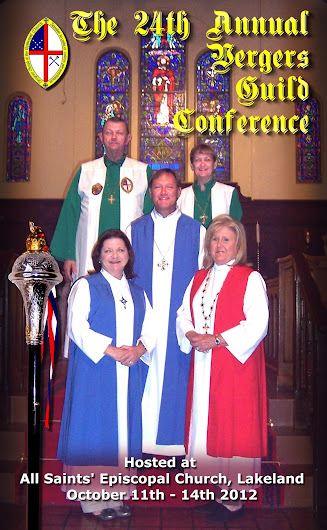 Cheryl Cantrall, the VGEC Membership Secretary, says that sixty people have signed up so far to attend the 24th Annual VGEC Conference, beginning on October 11th 2012 at All Saints Episcopal Church in Lakeland Florida. This is where we share experiences and ideas, learn from each other, and celebrate our role as “Liturgical Logisticians” serving our rectors and congregations. At this stage in the planning for the conference this is a great number of registrations. They are hoping to have over one hundred total conference attendees this year. Cheryl and Sid Glynn are putting on a “really great show” for us in October. Read on!!! Thursday night, be prepared, if you dare, to try “gator wrestling” under the supervision of Tim Williams from Gatorland. It’s a simple strategy, grab the gator by the tail, pull it into the sand pit in the middle of the moat, straddle it like a horse (long pants advised), catch its mouth while shut and hold it there, then roll it over and lullaby it to sleep. Come on. You can do it! Worry not, the hospital is just a few blocks away. Upon your return from visiting the medics, the hospitality suite and Vergers Guild Shop will be open at the Terrace Hotel. Friday, after Margaret McLarty’s President’s Report to the guild, there’s a workshop for you, from Verger 101, to baking your own Eucharistic bread, planning for parish security, developing a Liturgical Committee plan, or how one might meet a new priest who is unsure about the verger’s role in the parish liturgy. At lunch we’ll welcome the Rt. Rev. Greg Brewer for our Keynote address. Later, we’ll travel by bus for award-winning Spanish/Cuban cuisine, at the Columbia Restaurant in Ybor City, Tampa featuring their famous flamenco dance floor show. Saturday, after learning about The Order of St. Luke and our annual business meeting, stroll through the city using the Lakeland Walking Map and later, make your way out to the Lone Palm Golf & Country Club for the awards banquet, tropical style. Sunday morning, after vesting, the official conference group photograph will be made. Then we’ll get organized for the Procession of Vergers at the Choral Eucharist. After the service, farewell and best God’s Speed home to prepare for our Nashville Conference next year. Those needing special diet should notify Cheryl Cantrall or Syd Glenn. No coconut bras on guys at the Saturday banquet, otherwise best tropical atire. Whether you are flying to Tampa or Orlando, the travel to Lakeland will take around 90 minutes whether by Super Shuttle or rental car. Tampa, generally has lighter traffic. Great deal at the conference hotel, $89 per night!!! Shout out to Bill Gleason and Scott Smith for overhaul of the Vergers Guild Shop. More on that later.